"I think that after all the disasters that hit Russia in the twentieth century, beginning with World War I and ending with the "Perestroika", the fact that Russia has been preserved and developed, proves that our people have one extra chromosome." The Hon. Minister of Culture isn't aware that an extra chromosome is a symptom of one of several serious disorders, one of which is Down Syndrome. "There is no evidence that Tchaikovsky was a homosexual", Vladimir Medinsky told Interfax news agency, as he spoke about the biopic by acclaimed screenwriter Yuri Arabov. Perhaps the simplest explanation [re Medinsky and the job he got] is given by Vladimir Pribylovsky, head of the Moscow-based Panorama think tank. The Kremlin, he suggests, simply couldn't find anybody else. "It's not the kind of position that people fight for. It's not easy to find a person for this post," Pribylovsky says. "Perhaps there was a competition between fools and they simply chose the most patriotic one." 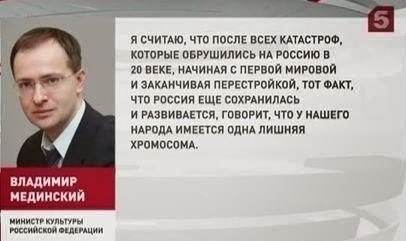 In any case, there are all the good reasons to suspect that, unlike most of the Russian people, prof Medinsky got more than the normal share of chromosomes. An extra testicle maybe, but a chromosome? As for Mr. T., if you've seen the Nutcracker (so to speak) ballet, you have no doubt of his orientation. An obvious preliminary to a full endorsement of goat love.